The academic study of religion at Kenyon College dates back to the late 1950s, when Prof. Denis Baly in the Political Science Department began teaching a few courses on religion, including one on Islam. In 1960 he was joined by Prof. Richard Hettlinger, who offered courses in Christian thought and was also the College Chaplain. 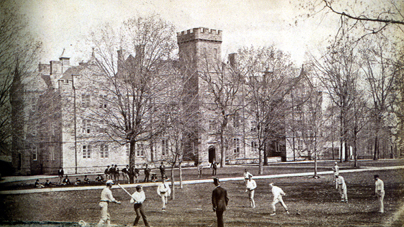 At this time there was still a graduate divinity school at Kenyon, Bexley Hall, but it left in 1968 to become part of the Colgate-Rochester Divinity School. The year 1965 marked the beginning of full departmental status, with the first offering of the major in Religion. This was also the year that Prof. Donald Rogan joined the faculty, doubling as Chaplain until 1971, when he resigned that post to teach full-time. In 1967 Kenyon was possibly the first Protestant-affiliated college or university to hire a full-time faculty member in Jewish Studies, a position that was held from 1968 through 1984 by Prof. Eugen Kullmann. In the early 1970s regular positions were added in Islam and Asian Religions, bringing the department roughly to its current shape. In 2000 the name of the department was changed from Religion to Religious Studies. Today the Department has five regular faculty members, offering courses in Judaism, Christianity, Religions of the Americas, Islam, Buddhism, South Asian, Central Asian, and East Asian religions, plus courses on various thematic topics and methodology in the study of religion. The department generally has from ten to fifteen students majoring in Religious Studies per year, and five to ten minors.